Whether you are in a blizzard of mayflies on a trout stream or a blizzard of snow on the ski slopes, you will find lots of great, reasonably priced food in the eastern Sierras. If you leave Los Angeles early in the morning for the Sierras, you are likely to feel hungry about the time you reach the village of Lone Pine. Just off Main Street is the Alabama Hills Café, with a breakfast worth the long drive. 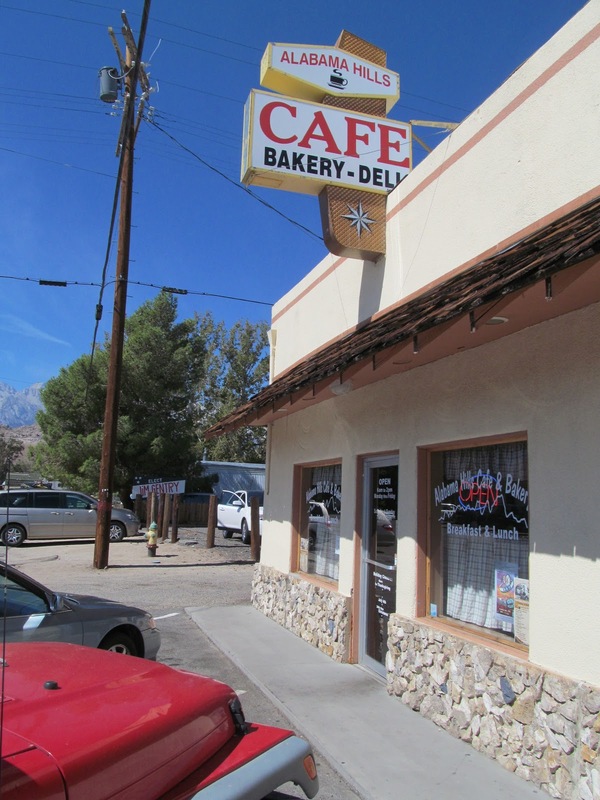 The Café, named after the hills to the west of Lone Pine, serves traditional, innovative and healthy breakfasts. My friend Dennis and I both tried pancakes: Dennis ordered them with fresh blueberries, I tried honey wheat nine grain. All around the room, we saw happy eaters enjoying fruit salads, waffles piled high with toppings healthy and decadent and home-made pastries with a cup of coffee. The Alabama Hills have been the setting for many movies, from early westerns to Star Trek episodes. I wonder if they came for a meal at the Café; oops, many of the films appeared before the Café was open . . .
For more about the region’s movie history, visit http://www.eugenecarsey.com/camp/alabamahills/movies.htm. For anglers a key requirement of a good restaurant is that it is open before or after the fishing trip. After some action-packed fishing on the Middle Fork of the San Joaquin River, Dennis and I were driving through Mammoth, seeking a restaurant still serving at day’s end. Through the surprisingly dark late summer night, we found Thai’D Up. We both enjoyed Pad Thai with a rich, brown sauce and two different beers from a local microbrewery. The next day, we ate a competent breakfast at the MacDonald’s in Mammoth. The food was a capably rendered MacDonald’s breakfast. What was noteworthy about the experience was how attractive this restaurant was. It looked more like a Victorian mansion than a fast-food outlet. We had lunch in June Lake, at the Tiger Bar and Cafe. We had great sandwiches, a French Dip with roast beef and a Reuben. The server was capable and friendly; the food arrived just in time for several tired anglers. After staying later on the stream the next night, even fewer restaurants in Mammoth were open. So, we went to a Von’s and got an assortment of appetizers, salads and cold cuts. We had these back at the hotel and accompanied them with one of the last bottles of Steelhead Red wine on the West Coast. Before returning to LA, we had breakfast at The Breakfast Club. We had meals, excellently cooked and capably served. Sometimes simple foods, grilled steak, home fries or yellow cake, are the hardest to cook right. The Breakfast Club got the basics exactly right. It was sad to leave the Sierras. However, I plan to return next year. It will be great to dine at these favorites again - - or to experiment and enjoy new restaurants.